Relaxed and laid-back, beautiful Koh Lanta is just offshore to the south of Krabi, and offers miles of unspoilt beaches. This up and coming destination is just a little too remote to have been fully discovered, but with a good range of hotels and a range of options for fabulous food and superb drinks, it’s not likely to be a hideaway for too long! The best beaches are along Koh Lanta’s west coast, where spectacular views across Phang Nga Bay, especially at sunset, make this a truly memorable, romantic destination. Head to Koh Lanta for a relaxing beach holiday, or combine it with nearby Krabi. It’s easy to include Bangkok in to your itinerary, while other parts of Thailand such as Chiang Mai and Koh Samui can be included via Krabi airport. The island of Koh Lanta is served by flights to Krabi airport, which is around two hours to travel from the airport to the island, by road and boat. 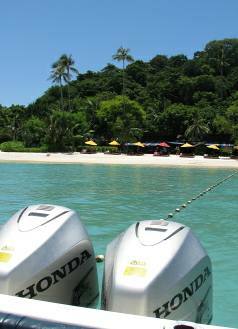 You’ll need to arrive in to Krabi in the morning, or spend the night before there. Rawi Warin Resort & Spa is an award-winning luxury resort located in Lanta Island. Serene and secluded, Rawi Warin sits proudly between the beautiful Andaman sea and the abundant tropical rainforest of the island of Lanta Yai. A hideaway in a striking bay-front setting, Pimalai Resort and Spa Koh Lanta has almost a thousand yards of talcum sand beachfront. This luxurious resort is perfect for pampering in a secluded setting. Elegant, tranquil and perfectly positioned on one of the best beaches of this unspoilt island, Layana Resort and Spa Koh Lanta is an intimate hotel ideal for relaxation and pampering for adults.